Fenway Park recently announced a 9% average increase in ticket prices, all but the lowest and highest priced tickets will increase. Lower bleacher seats will cost $26 and grandstand seats will cost $50. The team says increases are to pay for player salaries and improvements at the ballpark -- I guess they don't take any salaries. Green Monster tickets will set you back $140; if you are coming to Boston next year and plan on going to Fenway, check out ticket prices here. 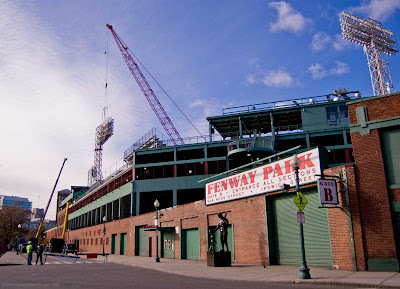 In the picture above you can see a construction crane in use at Fenway.